How far would a woman go to keep her world safe? This is the question that A.S.A. 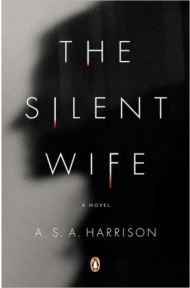 Harrison asks of her readers in her debut novel, The Silent Wife. Actually, it will be her only novel, as after years of being an almost-there novelist, she tragically died in April, just a matter of weeks before this book is due to be released. As a writer, I feel the timing of this loss to be extra cruel, to come so close and then never live to see your work in its finished form upon the book shop shelves. As a reader, however, I felt glad that at least she knew it was going to be published, unlike Steig Larsson, whose great books carry an unpolished air about them due to his sudden death before he could work with an editor to give them the last finishing touches. The Silent Wife does feel finished and accomplished and has been attracting many positive reviews from around the world. Having been presented with the opening question above and the knowledge that she had been invited by Val McDermid to speak at a crime writing festival (which she sadly didn’t live long enough to do), I was expecting something closer to a thriller than what I got. Perhaps this is why you shouldn’t judge a book by its cover – or by its press release. What we have is the story of Todd and Jodi, an affluent forty-something couple living in Chicago. He is a self-made property developer running a successful business, she a part-time psychologist who sees her clients in their beautiful apartment with the enviable lake view. Together for twenty years but unmarried and with no children, they seem mostly content. Todd, however, lives a dual life as a serial cheater, something which Jodi is firmly in denial about. She acknowledges his affairs by taking petty revenges – hiding his keys, spiking his bedtime drink with something she knows will make him sick in the morning – but never tackles the issue head on. She is comfortable and content and sees no reason to change things, until Todd’s latest fling becomes a threat she can’t ignore. Having got the half-his-age daughter of his oldest friend pregnant, he elects to leave Jodi for her, to settle down as a husband and father. Realisation slowly dawns on Jodi that her refusal to marry Todd in the early years of their relationship, and her decision to abdicate all financial responsibility to him, has left all their assets in his name alone. Faced with having nothing from a relationship that has lasted nearly half her life, what can she do to save herself? Written as a perspective on a relationship falling apart that is told alternatively from his and her perspectives, The Silent Wife has inevitably drawn comparisons with Gillian Flynn’s Gone Girl. Having recently finished Gone Girl, The Silent Wife does indeed feel like something cut from the same cloth, albeit a subtler and less thriller-like cloth. It is not the shocking, twisting story that Flynn gives us, but neither is it a straightforward piece of crime fiction either – and I don’t worry about calling it crime fiction because you can see as well as I can what Jodi’s way out of this scenario is. The first half of The Silent Wife is plotted well and is a compelling read, but it fades away somewhat later on. A sub-plot that involves Jodi’s brother surfaces for no good reason and intrudes on the main story. The initially promising characterisation shows flaws: Jodi is educated, intelligent, sophisticated, so why is she completely oblivious to the fact that there is no such thing as a common law wife? With many fictional characters I could have felt great sympathy at a woman being about to be left homeless by her unfaithful partner, but with Jodi I just felt annoyance: she turned down the chance to get married; ignored the importance of having her name added to the deeds of their home; chose to turn down the lucrative income stream that longer working hours would have provided to indulge herself in expensive nothings, and spent what money she did make on extravagant and usually unwanted gifts for Todd rather than giving herself some financial independence and security. What Todd does is utterly wrong, but for someone like Jodi, the outcome was utterly avoidable. I found this frustrating and it perhaps prevented me from finding the whole as satisfying as might otherwise have done. In the end, this was a good but not great read for me. It didn’t quite manage the brilliant clever ending that I had been expecting; the fading plot over the latter stages of the book had left me holding out for a final, clever twist to the ending that would make my change my mind. The twist, such as it is, was one that had been evident for several chapters, leaving the novel to finish on a whimper rather than a bang. Having said that, this was a book that is still worth reading if you are a fan of crime novels; it is not often that you read a story about a crime that isn’t a police procedural or some other variant of whodunit, and that in itself makes it worth investigating. Recommended (to fans of crime fiction). No Comments on "The Silent Wife"